Loss of grassland has been a challenge for many of the region’s native residents. Birds, insects and other wildlife that need a prairie ecosystem to survive have less room to roam. David Wedin, a professor at the University of Nebraska’s School of Natural Resources, says much of the area converted to cropland is marginal land, highly susceptible to erosion and the runoff of agricultural chemicals. The U.S. Department of Agriculture actually pays farmers to convert highly erodible land back to native vegetation with the Conservation Reserve Program, or CRP. First implemented in 1985, it was an attempt to turn the tide of over-development. Now, several environmental groups are working in the Midwest to turn back the dial of history. 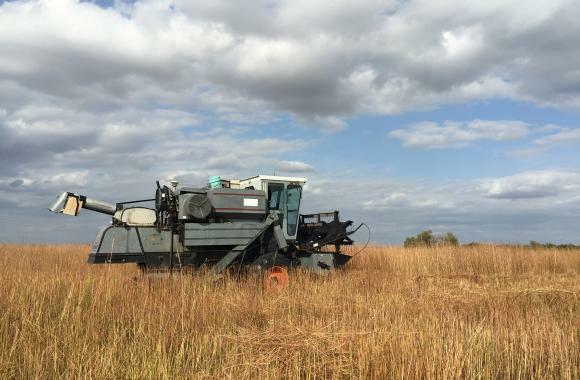 The Prairie Plains Resource Institute, a Nebraska nonprofit that educates people about the prairie, is laboring to save local grassland seed and restore Great Plains prairie. Inside a shed on the Institute’s grounds just outside of Aurora, Neb., is where the life of a new prairie begins. Rows and rows of garbage barrel containers are piled to the brim with some 250 species of seed. Some of the seed was harvested by hand and some by combine, but all of it is from existing Nebraska prairies. Bullerman and two assistants put on dust masks and goggles. They dump a few barrels of seed in a circle on the floor, then use shovels to heap the contents into a six-foot pile in the center. Sarah Bailey, the Prairie Plains greenhouse manager heaves a scoop of seed into the mixed pile. Bullerman and the crew haul the seed on a flatbed trailer 30 miles away to an ex-cornfield that is to be planted back to tallgrass. The team dumps the seed into 1950s-era spreaders hitched up to four-wheelers to plant the ground. The land is flat, but water has pooled in a few shallow areas – and that’s by design.